Q. Mosquitoes are an essential player in the life cycle of Dirofilaria immitis, which causes heartworm infection. 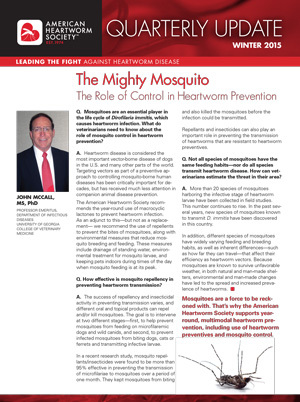 What do veterinarians need to know about the role of mosquito control in heartworm prevention? A. Heartworm disease is considered the most important vector-borne disease of dogs in the U.S. and many other parts of the world. Targeting vectors as part of a preventive approach to controlling mosquito-borne human diseases has been critically important for decades, but has received much less attention in companion animal disease prevention. The American Heartworm Society recommends the year-round use of macrocyclic lactones to prevent heartworm infection. 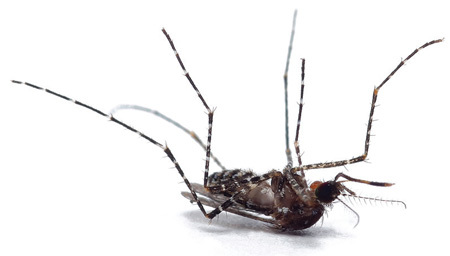 As an adjunct to this—but not as a replacement—we recommend the use of repellents to prevent the bites of mosquitoes, along with environmental measures that reduce mosquito breeding and feeding. These measures include drainage of standing water, environmental treatment for mosquito larvae, and keeping pets indoors during times of the day when mosquito feeding is at its peak. Q. How effective is mosquito repellency in preventing heartworm transmission? A. The success of repellency and insecticidal activity in preventing transmission varies, and different topical products can repel and/or kill mosquitoes. The goal is to intervene at two different stages—first, to help prevent mosquitoes from feeding on microfilaremic dogs and wild canids, and second, to prevent infected mosquitoes from biting dogs, cats or ferrets and transmitting infective larvae. In a recent research study, mosquito repellants/insecticides were found to be more than 95% effective in preventing the transmission of microfilariae to mosquitoes over a period of one month. They kept mosquitoes from biting and also killed the mosquitoes before the infection could be transmitted. Repellants and insecticides can also play an important role in preventing the transmission of heartworms that are resistant to heartworm preventives. Q. Not all species of mosquitoes have the same feeding habits—nor do all species transmit heartworm disease. How can veterinarians estimate the threat in their area? A. More than 20 species of mosquitoes harboring the infective stage of heartworm larvae have been collected in field studies. This number continues to rise. In the past several years, new species of mosquitoes known to transmit D. immitis have been discovered in this country. In addition, different species of mosquitoes have widely varying feeding and breeding habits, as well as inherent differences—such as how far they can travel—that affect their efficiency as heartworm vectors. Because mosquitoes are known to survive unfavorable weather, in both natural and man-made shelters, environmental and man-made changes have led to the spread and increased prevalence of heartworms. Mosquitoes are a force to be reckoned with. That’s why the American Heartworm Society supports year round, multimodal heartworm prevention, including use of heartworm preventives and mosquito control. For more information on this and other heartworm topics, visit heartwormsociety.org.